The 2019 Volkswagen Golf has many exciting features that will appeal to a wide range of consumers. It is a great option for people looking for a commuter that gives them great gas mileage and a decent number of standard features. That being said, there are a few drawbacks to this vehicle that may make it less than ideal for some. For the new year, the biggest shake-up for the Golf comes underneath the hood. Gone is the 1.8L engine, replaced instead with a 1.4L 4-cylinder option. Although this will result in a slight drop in horsepower, it does not impact the torque and is estimated to improve the already impressive fuel economy. In order to keep up the power, there are two new transmissions options as well. There is new standard equipment for the 2019 Volkswagen Golf. These features are aimed at safety and include things such as automatic emergency braking, blind-spot monitoring with rear cross traffic alert, and forward-collision mitigation with pedestrian detection. The SE trim can be further upgraded this year with the available Drivers Assistance package. The Volkswagen Golf sticks with its iconic hatchback design in 2019. It still manages to look modern and fresh, thanks to the LED taillights and LED daytime running lights. Drivers can also add a panoramic sunroof that has the ability to both slide and tilt. Not only does this add style to the exterior look, but it also gives drivers a breathtaking view of their surroundings. Depending on the trim level selected, drivers will have up to 7 vibrant exterior paint choices. One of the most impressive things about the 2019 Golf is the extensive list of standard and available safety features. In fact, the Insurance Institute for Highway Safety gave this vehicle the highest rating in five of their crash tests. The National Highway Traffic Safety Administration also gave the 2019 Volkswagen Golf a 5 out of 5 rating. Available safety features for the 2019 Volkswagen Golf include lane keep assist, lane departure warning, automatic high beams, and front and rear parking sensors. Drivers will find many convenient and fun technology features in the new Golf. Coming standard across all trim levels is Apple CarPlay and Android Auto compatibility. Other standard features include Bluetooth, a USB port, and an eight-speaker stereo system. For those looking to add more tech, available features include keyless access with push-button start and a navigation system. Moving up through the trim levels give drivers larger touchscreens with more abilities. There are both standard and electric versions of the 2019 Volkswagen Golf. Standard versions come in 3 different trim levels, while the electric comes in two. The trim levels of the standard Golfs are called the S, SE, and R, and the electric trims go by SE and SEL Premium. Each trim level comes with plenty of standard features, giving drivers lots of options depending on their budget and their needs. Many consumers will find that the SE trim is a good balance of features while still not breaking the bank. The cabin of this vehicle is completely full of top-of-the-line materials. 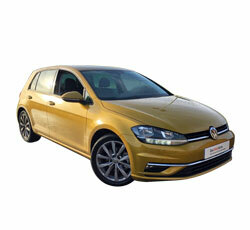 In fact, many reviewers compare the cabin of the Golf to the interior of luxury vehicles. Volkswagen set out to give the interior of this car a European feel and it shows. Thanks to the well-done suspension, drivers and passengers alike can enjoy the ride without worrying about bumps in the road. The high and flat roof ensures that everyone getting into the Golf will have plenty of headroom. Many people were concerned when they heard that the 2019 Volkswagen Golf would have a smaller engine. As it turns out, there was nothing to worry about. The new Golfs still have nearly as much horsepower and just as much torque. Coming standard on these vehicles is a 6-speed manual transmission. An automatic 8-speed transmission is available as well. Drivers who have their heart set on more power can go with the Golf R, which comes equipped with a 2.0-liter turbo-four engine. Volkswagen gave the new Golf a smaller engine largely to improve fuel economy. The base engine will give drivers an astounding 29 MPG in the city and 37 MPG on the highway. This is true no matter which transmission drivers choose. Anyone going with the larger 2.0 liter engine will take a slight hit in fuel economy. These Golfs will get 23 MPG in the city and 30 MPG in the city, which is still fairly impressive. No matter which trim drivers select, they will not be wasting all of their time at the pumps. People looking for a compact car that can still help them haul all of their gear will love the cargo space in the 2019 Volkswagen Golf. With the seats up, drivers will find 22.8 cubic feet of space. Fold those backseats down to have a spacious 52.7 cubic feet. This is a very impressive amount of space for vehicles in this class. It beats one of its biggest competitors, the Honda Civic. The 2019 Golf is a very practical choice for a wide variety of people. The sharp handling of this vehicle makes it a joy to drive. It manages to remain sharp yet gentle around turns. Although many people would hesitate to call the Golf a sports car, it definitely has an athletic feel. Most Golfs come with front-wheel-drive, while the R trim comes standard with all-wheel-drive. Either way, this vehicle is fun and easy to drive. The standard rearview camera helps drivers back-up with confidence. It features an extra-wide lens to give an even better view than a standard rearview camera ever could. Designed to help drivers see obstacles while in reverse, this is just one of the features that make this vehicle so safe to drive. Although most experts agree that the 2019 Volkswagen Golf is a fun car to drive, the steering is considered to be a bit numb. While many drivers might not even notice this, some may find it takes away from the sporty feel the Golf is going for. Drivers who like to be in highly in tune with their vehicle may find the steering to be a bit frustrating. There is much to love about the technology in the 2019 Golf, but the graphics on the Infotainment system are a bit lacking. The larger 12.3" screen in particular, which comes in the R trim, has graphics that look less than crisp. Again, this is an issue that many people may not even notice, while others may find it to be a deal-breaker. The 2019 Volkswagen Golf scores a 3 out of 5 when it comes to reliability from J.D. Power. Although this is certainly not bad, some drivers may shy away from investing in something that did not get a higher score. The Golf is considered to be very comfortable overall, but taller individuals may find the backseats a bit low to the ground. This can make getting in and out a bit tedious, although they should find plenty of legroom once they are settled in. With all of the smart devices out there these days, some consumers may find the single USB port that comes in the new Golf to simply not be enough. Some of the Golf's rivals offer two or more ports, and many vehicles are moving toward USB-C ports. USB-C seems to be the wave of the future for both smart devices and vehicles. Overall, the 2019 Volkswagen Golf is a strong competitor among compact cars. Drivers shopping in this category may also consider the Honda Fit, Civic, or the Mazda3, but overall the Golf has more space and standard features. Volkswagen also offers drivers the Jetta, which is less expensive and enjoying a new design in 2019. However, it is not as spacious and does not have nearly as nice of an interior. At the end of the day, the 2019 Volkswagen Golf is a well-designed vehicle that is worth serious consideration for drivers. It would be challenging to find a vehicle that offers more space for both passengers and cargo and gets such impressive gas mileage. Consumers seeking a stylish vehicle that comes with plenty of standard technology and advanced safety features will be very impressed with the 2019 Golf.